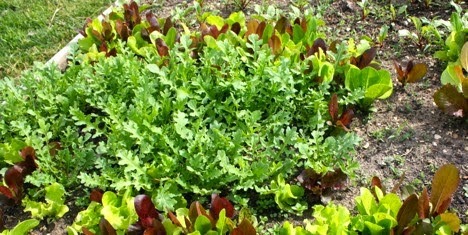 If you are like many other local gardeners you planted salad greens this year and have started to harvest them. It was just yesterday that I picked/thinned my first bag of green goodness from my raised garden beds. 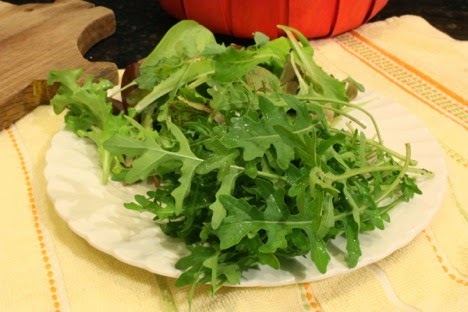 Lets take a look at what you might do with your lovely greens now that it’s harvest time. Most Americans are not as adept in using greens to cook with or making their own salad dressing as the Europeans are. The French are very experienced in both of these culinary pursuits, as are many other European countries. Why buy store bought dressing when it is so very easy to make great salad dressing in your own home? When you make your own dressing you get to choose what type of oil to use. Walnut oil, great light viscosity and lovely nutty taste. Avocado oil, heavy viscosity, but very healthy and great taste too. Extra virgin olive oil, the classic Italian, French and Spanish choice. Garlic infused olive oil, garlicky goodness. Need I say more? Sesame seed oil, great for Asian flavored salad dressings. Pumpkin seed oil, exotic earthy taste. Delicata squash seed oil, much like pumpkin seed oil. 1 teaspoon dried Italian herbs, or 1/2 teaspoon basil, and 1/2 teaspoon oregano. Mix dried herbs with vinegar. Add garlic or shallots if using and mix well. Add oil, mix well. Can be used right away, but gets better after being refrigerated for a day. Soak Truffle Hunt blend in vinegar and red wine for 5 minutes. Combine all ingredients and mix well by shaking in a jar or in a bowl with an immersion blender. Goes well on mixed baby greens or romaine lettuce. Minced garlic or shallots(1 teaspoon) may be added for more zip! 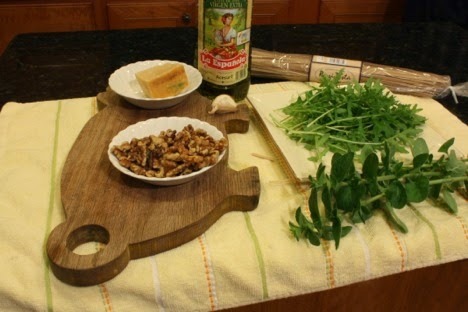 Top each salad with 1 tablespoon feta cheese crumbles, and 2 teaspoons of toasted pine nuts. For an Asian version omit oregano, basil and cheese. Use 3 tablespoons of olive oil and 4 tablespoons of sesame oil plus a tablespoon of soy sauce. Minced fresh ginger would work well too. 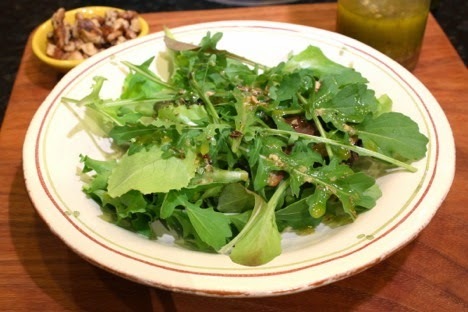 You can use either dressing on one kind of greens, or a mix of greens such as, kale, arugula, spring green mix, etc. My favorite greens are the Rocky Top Mix from Baker Creek heirloom seeds. This year I am trying some new lettuces from Baker Creek such as: May Queen, an early maturing butterhead lettuce. Petite Rouge, an old world crop that requires cooler temeratures. Pablo, a stunning Batavian style that is lavishly splashed in vibrant bronze purple. Blue Kale, kale with a tinge of blue. All of the above new types of greens seem to be doing well, and are just waiting to be tasted to see how they rank. Let us talk about cooking greens. Americans have of course known of collard greens and spinach, but I want to take you further down the rabbit hole. 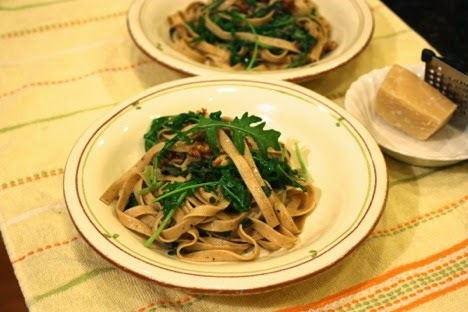 Why not put arugula in your pasta dish, or kale in your soup? Or grill a chunk of lettuce like some restaurants do with romaine in a Caesar Salad. Yesterday I cooked up about five ounces of fettucine, rinsed and set it aside. Then I took 2 cloves of garlic and sauteed it in 2 tablespoons of olive oil for two minutes on medium low heat. I then added the fettucine and incresed the heat to medium tossing the pasta about for 3 minutes. To this I added a nice size handful of fresh arugula, and fresh oregano leaves from my garden and mixed it in well while continuing cooking for 3 more minutes. To finish it I added 1/2 cup of pan toasted walnuts, and 2 tablespoons of fresh grated parmesan cheese. My lunch guests pronounced it great! This dish took all of 20 minutes to make from scratch, and you can do it too. Just remember to toast your walnuts ahead of time in a saute pan, stirring frequently on medium heat for about 5 minutes in 1/2 teaspoon oil, (avocado, peanut, or regular olive oil) and a bit of garlic powder, salt and pepper. If you do this while the pasta is cooking you will be ahead of the game. This healthy creative dish will impress you family or guests. Please visit my website for more recipes like these to help you find new ways to use your garden treasures this Spring and Summer and don’t forget to sign up for my free newsletter. If you comment on my most recent post you will be entered into a drawing for a package of five seasoning blends from Urban Accents, including the Mushroom Truffle Hunt blend in the salad dressing above. Drawing to be held next week. This will come in handy. I threw in all my “old” lettuce seeds into one of the sections of my UMD Salad Table and it's coming in like gangbusters! I'll also be juicing.